Now available!! Total cost in the U.S. is $15.00 (includes S&H); Europe $18.00. Musician and disc jockey Bill Woods, one of the founders of the legendary Bakersfield, Calif. country music scene of the 1950s and '60s, died Sunday. He was 75. Woods had undergone heart surgery in March and suffered a stroke on Saturday. He died at San Joaquin Hospital. His death comes only weeks after the passing of West Coast country music giant Tommy Collins; the two, along with Ferlin Husky and others, laid the foundation for the Bakersfield club scene shortly after WWII. It was this scene that spawned the Bakersfield Sound: a raw, raucous, electric guitar-driven brand of country music that changed the form and helped Hollywood -- the West Coast recording center of the movement -- challenge the primacy of Nashville as a creative and commercial base. 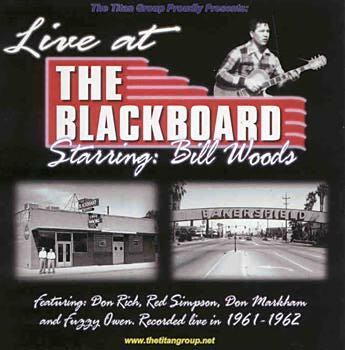 As bandleader at the famed Blackboard Club for 14 years, Woods was the mentor of many key performers of the era, including Buck Owens -- whose first paying gig in Bakersfield was playing guitar for Woods and his band, the Orange Blossom Playboys -- and Merle Haggard, who years later recorded Red Simpson's country ode to the bandleader, "Bill Woods from Bakersfield." Simpson said of Woods: "He was pure country. If you want to know the history of the Bakersfield sound, it's all in that song. He helped everybody." Woods was a key figure in the development of the fledgling Hollywood- based Capitol Records and helped launch the careers of several of Capitol's country stars such as Collins, Husky, Owens, Haggard, Dallas Frazier and Jean Shepard. 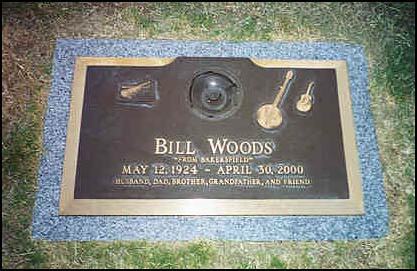 Born in Texas, Woods moved with his family to California in 1940, and the young musician scored his biggest success in the decade after that as piano and fiddle player for Tommy Duncan, vocalist of the Country Music Hall of Fame Bob Wills band. 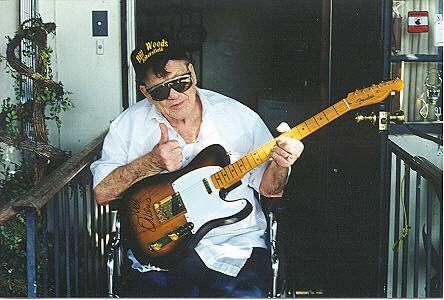 In addition to working as a bandleader and local disc jockey, Woods raced stock cars. 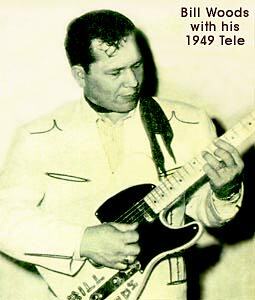 In 1963, at the Bakersfield Speedway, Woods stepped in for a destruction derby driver who failed to show, and he was slammed in a three-car pileup, severely injuring his back, effectively sidetracking his musical career. That same year, ironically, Woods scored his only hit record with Red Simpson's classic song "Truck Drivin' Man." By the '70s Woods had recovered enough to play piano on tour with Haggard in 1972-73. Woods also cut several tunes as a member of Haggard's band, including the No. 1 hit "It Ain't Love But It Ain't Bad." Archival recordings of his work were released in the '90s, including "Live at the Blackboard" and "California Gold Records." Bill Woods and his friends that I took onstage last year at The Rasmussen Senior Adult Center, 115 E Roberts Ln, Oildale, CA (suburb of Bakersfield.) This is where Red Simpson performs every Tuesday. All these men were early Pioneers of The Bakersfield Sound Left To Right: Bill Woods - Billy Mize - Gene Moles - Red Simpson and Johnny Barnett We lovingly call this picture The Bakersfield Mafia. May 3, 1998 at the last honky tonk in Bakersfield for a benefit for Henry Sharpe, a local musician that had passed away. Left to right: Bill Woods - Billy Mize - Glenn J. Pogatchnik and Roy Nichols. Back row: Johnny Cuviello, drums and Lawrence Williams, piano. Front row: Dom Markham, saxaphone; Buck Owens,guitar: and Bill Woods, leader, guitar & fiddle. Nashville has long touted itself as the Country Music Capital of the World, and there's no denying it: the city emerged as the hub of the country recording industry during the 1950's. But dating almost that far back, Nashville has had a pesky, if unlikely, rival: Bakersfield, Calif., a town at the southern end of the San Joaquin Valley rich in cotton, oil, truck stops and dance halls. Initially, the music coming out of Bakersfield posed a commercial threat to the hegemony of the Nashville hit mill. Leading the charge were Buck Owens and Merle Haggard, who from 1962 to 1976 racked up 44 No. 1 singles between them, including Mr. Owens's "Act Naturally" and "Together Again" and Mr. Haggard's "Okie from Muskogee" and "Mama Tried." Abetted by a pack of like-minded upstarts, the two men galvanized the city's honky-tonk scene, which by the late 60's had gained the tag Nashville West. But even more of a threat than the millions of records these West Coast singers sold was the way that the hard-driving, willfully unvarnished sound they patented often cast judgment on Nashville's slick, pop-leaning aesthetic. More akin to the insurgent burst of first-generation rock 'n' roll than the conservatism of the Grand Ole Opry, the Bakersfield sound embodied a countervailing ethos, a spirit of rebellion that persists among twang-loving nonconformists today. "I came here looking for something I couldn't find anywhere else," sang Dwight Yoakam on "Streets of Bakersfield," his chart-topping 1988 duet with Mr. Owens, who first recorded the song in 1972. "Streets of Bakersfield" is not only a resounding statement of purpose, it strikes at the heart of why the city has remained a symbol of hard-country credibility long after its commercial heyday. The latest exponent of the Bakersfield sound is Gary Allan, a 33-year-old surf bum from Orange County, Calif., and an Academy of Country Music awards nominee for best new male vocalist. Mr. Allan, whose new album, "Smoke Rings in the Dark," is about to be certified gold for sales of 500,000 or more, is the first West Coast-identified country singer to taste mainstream success since Mr. Yoakam. Mr. Allan's album isn't as down-home as others recently released by hard-core traditionalists like Heather Myles or the Derailers, or even some of those made by the Nashville transplants Jim Lauderdale and the Mavericks. "Smoke Rings in the Dark" favors, however, material about life's jagged grain, songs suited to Mr. Allan's rugged baritone that update classic country themes of drinking and cheating with little hint of clich�. It also evinces a stylistic maturity and depth of feeling, as well as showing off plenty of shuffling rhythms and sobbing steel guitar -- things rarely heard among the sound-alike ditties currently coming off the Nashville assembly line. Born not of some sterile recording studio but of the noisy honky-tonks, Mr. Allan's music, though quite contemporary, is very much in the vein of the turbo-charged twang that Mr. Owens and his Buckaroos were perfecting 30 to 40 years ago. Mr. Owens recognized this kinship at his Crystal Palace dance hall in Bakersfield last month when he presented Mr. Allan with one of his custom-made, 1967 guitars. Asked what he hears in Mr. Allan's music, Mr. Owens, speaking by phone from Bakersfield, replied: "Gary knows what he wants, and he's managed to sing the kind of music that he likes. If he can't do it the way he hears it, I think he would be one of those people who'd say, 'Look, this isn't going to work.' "
This refusal to be packaged the way that many Nashville singers are is the hallmark of the Bakersfield legacy. For example, when Mr. Owens first heard the phrase Nashville West, he turned right around and dubbed Nashville "Bakersfield East." Mr. Owens is no anomaly: from Mr. Haggard to Mr. Yoakam, California country singers have written their own rules, and most have shunned Nashville, opting to live, record, and conduct their affairs -- which, in Mr. Owens's case, includes overseeing his entertainment empire -- on the West Coast. This independent streak can be traced at least as far back as the Great Depression, when dirt farmers from Texas, Arkansas and Oklahoma fled the Dust Bowl to seek fortune in the "brown gold" of the fertile San Joaquin Valley. Yet instead of finding riches, most encountered backbreaking work, subsistence pay and life in labor camps crowded, as Mr. Haggard sang, "with worried men with broken dreams." Mr. Owens, the Texas-born son of a sharecropper, picked cotton and peaches in Bakersfield as a kid; his hardscrabble childhood could easily have been a chapter out of "The Grapes of Wrath." "Growing up like that made us self-reliant," he said. "It made us defiant, and that carried over to the music that people brought to this area. No one was going to tell people out here how to play their music, and I think that attitude's been passed along. I also think that's why the music that came from here sounds so raw-boned." The austere music of which Mr. Owens speaks -- fiddles, acoustic guitars, an occasional banjo -- was originally the province of the canvas-covered cabins of the migrant labor camps. Amplification did not enter the picture until the 40's and 50's, when those homemade sounds were transplanted to the rough-and-tumble beer joints and dance halls that sprang up in and around Bakersfield. Before long, the din-piercing blend of honky-tonk and Western swing birthed in local clubs like the Blackboard and the Corral evolved into a distinctive hybrid. It also yielded a crop of nationwide hits from the likes of Jean Shepard, Wynn Stewart and Rose Maddox -- and later, Mr. Owens and Mr. Haggard -- that stood in stark contrast to the then-reigning ultra-smooth Nashville sound. The lush strings and creamy background crooners favored on Nashville's Music Row during the late 50's and 60's might have been aimed at widening country's adult audience and at recouping sales lost during the initial onslaught of rock 'n' roll. But Music Row's uptown flourishes could also smack of putting on airs, of trying to live down country's rural past. By contrast, the Bakersfield sound embraced those roots with a vengeance. The way, for example, that Mr. Owens and the producer Ken Nelson hot-wired whining fiddle-and-steel and gutbucket guitars to jumpy rockabilly rhythms was tantamount to a counterattack. Even the songs the West Coasters wrote, plainspoken slices of life about prison, truck driving and scratching out a living, exuded this grit. The same is true of the clothes they wore. The cowboy duds sported by Stewart and Maddox may have been spangly and colorful, but their ranch-style cut and cowpoke embroidery also revealed ties to the land that were carefully concealed by the tuxedos and cocktail dresses donned by Nashville stars like Eddy Arnold and Patsy Cline. Nevertheless, Bakersfield's outsider ethos and rough-hewn aesthetic have endured, mainly among country-rock bands like the Byrds and the Flying Burrito Brothers and edgy mainstream country acts like Emmylou Harris, Rodney Crowell and Marty Stuart. The Bakersfield sound also seeped into the music of Los Angeles roots-punk bands like the Blasters and Los Lobos and gained a foothold within the city's late-80's neo-honky-tonk scene, which coalesced around the Palomino Club in North Hollywood. Yet besides Mr. Yoakam, Gary Allan has been the only West Coast country singer since Mr. Owens and Mr. Haggard to achieve widespread commercial appeal while clinging to Bakersfield's ethic of nonconformity. "Learning How to Live With Me," the centerpiece of his latest album, finds Mr. Allan contemplating both his place in this tradition and his own emerging legacy. "I know the way I am is who I'm gonna be," Mr. Allan sings. As the resolute rimshots and growling guitar kick in, and the fiddle and steel etch this self-awareness deeper into Mr. Allan's mind, the pride in his blues-tinged baritone reveals just how deeply he has embraced West Coast country's self-reliant stance. Indeed, as Mr. Owens, Mr. Haggard and Mr. Yoakam did before him, Mr. Allan is defining himself in opposition to the often compliant cogs in the Nashville machine. Bill Friskics-Warren, a writer in Nashville, is collaborating on "Heartaches by the Numbers," a critical guide to country's 500 greatest singles.